Idaho Crush Volleyball Club, Inc. ("Idaho Crush") is premised on the belief that volleyball players are made not born. We focus on practice even more so than on competition. We believe in learning fundamentals and skills and then developing consistency through high volume and high intensity repetition. Volleyball is a challenging sport for young players. It takes hours of practice to develop the skill level needed to compete at the highest levels. If you are looking for a club that teaches correct fundamentals, demands maximum effort, and that will challenge you to be the best player that you can be then Idaho Crush is for you. At Idaho Crush we believe that we can compete with the best clubs in the United States and that our athletes are as good as the best volleyball players in the country. Despite being a relatively new club, Idaho Crush has been recognized by US Club Rankings and Prepvolleyball.com as a regional power and our athletes (see commitment list above), are being recruited by some of hte top volleyball programs in the nation. Our top teams compete at the highest levels of club volleyball. We encourage you to review our record--we will tell you exactly how we place at regional and national tournaments. If you aspire to play at the highest levels of club volleyball and to be tested against the very best in the sport, then Idaho Crush is for you. The 2018 club year has already been a banner year for Idaho Crush...Idaho Crush will be sending a record 15 athletes (2018 grads) on to the next level (see college commitments above). Idaho Crush went a collective 36-17 Colorado Crossroads with a 4th place finish in 18s, 12th in 17s and 18th in 15s (all in OPEN division). 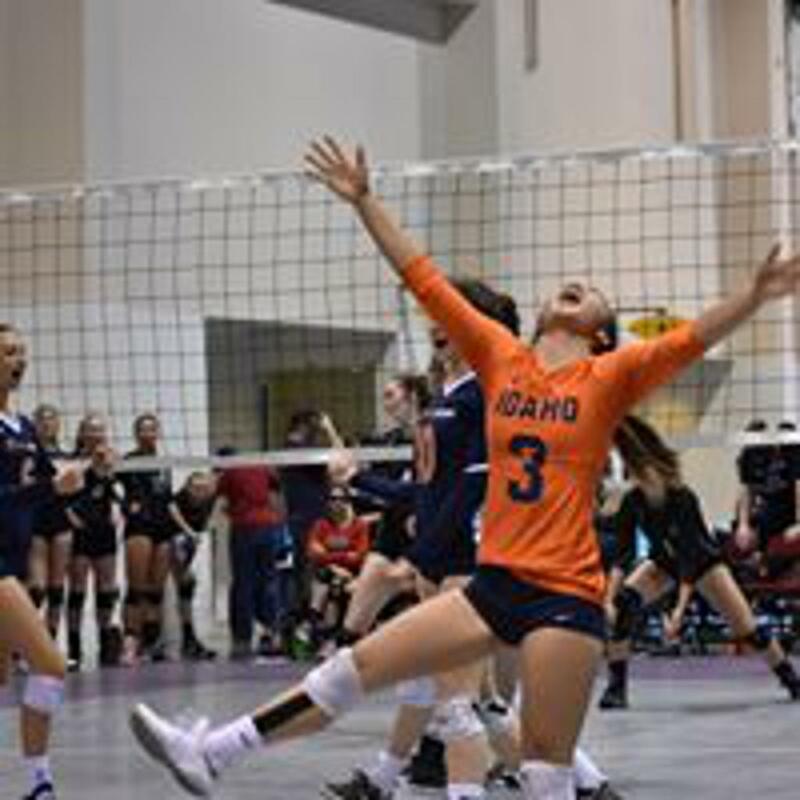 Already, three teams from Idaho Crush have qualified for Junior Olympics (18 National in Open, 18-2 in National, and 17 National in National). In 2017, Idaho Crush became the first Idaho Club to qualify a team for the Junior Olympics in "Open Division"...the highest division of USAV volleyball. This years team becomes the second team ever from the State of Idaho to do what it did last year. Idaho Crush 18 National team also took 4th place at the prestigeous Triple Crown National Invitational Tourney. The top 18 team also took 4th in Open at the Northern California qualified and repeated as champions of the Matt Hartner Memorial Classic. The 17 National and 15 National were the highest placing team for their respective age groups. Last year, Idaho Crush 17 National team took second at the Triple Crown NIT--the most competitive tourney outside of JOs or AAU Nationals. And finished with a top 20 national ranking. The 18s, 17s, 16s and 14s all competed at USAV Junior Olympics. The previous year, in 2016, Idaho Crush 18, 17 and 16 Nat'l teams were the USAV regional champions (Intermountain Region Volleyball Association). Idaho Crush 15, 14 and 13 National teams won AAU Super Regional Tournaments. Idaho Crush 16 Nat'l team finished in the top 10 in Indianapolis at the USAV Nat'l Championship tournament (16U Nat'l Division) and Idaho Crush 18 Na'tl team finished top 20 in Milwaukee (18U Nat'l Devision). Idaho Crush 14 Nat'l team took 6th place at the prestigious Triple Crown National Championship Tourney and finished top 15 at the JVA World Challenge in Kansas City. The 16 Nat'l team took 5th and 7th at the Pacific Northwest Nat'l Qualifier (Spokane) and Sourthern Cal Nat'l Qualifier (Los Angeles) playing in the Open division and achieved a national ranking from Prepvolleyball.com. All in all, Idaho Crush teams won a total of 6 regional championships (either USAV or AAU), had 5 top 10 finishes (7 top 20 finishes) at USAV Nat'l Qualifiers. This builds on a 2015 year where Idaho Crush teams won a total of 16 local or regional tournaments, including three AAU Super Regional Tournaments, an IVA USAV National Bid, a 3rd Place finish at the AAU West Coast Championships. In 2015, Idaho Crush left USAV National Qualifiers, with two top 5 finishes, two 9th place finishes, and a 14th finish. The Idaho Crush 15 Nat'l team obtained a top 10 (7th) regional ranking and national honorable mention ranking by Prepvolleyball.com. In 2014, Idaho Crush teams finished 2nd at the AAU West Coast Championships, 3rd at the Triple Crown National Chamionships, 5th at PNQ and 13th at Far Westerns. Idaho Crus teams won a total of 15 local and regional tournaments including three AAU super regional tournaments in two different regions. We encourage you to see our Pride tab to review the accomplishments of our teams. We appreciate all the hard work and sacrifice of the girls, their families and the coaches. We celebrate their successes and dedication. The pictures and wins highlighted throughout the website tell only half the story. As stated, our focus is on practice and skill development. The real Idaho Crush story is what happens each day in practice, in our individual skill development and conditioning workouts. If you are interested in seeing why our teams our successful, come to our practices and/or individual workouts--they are intense. We want you to watch our coaches teach and watch our athletes develop skill and attributes through rigourous, high volume and high intensity work. If you are interested in playing for a club with players and coaches that give maximum effort and that play hard on every ball, regardless of practice or competition, then Idaho Crush is for you. Go CRUSH!!!! ©2019 Idaho Crush Volleyball Club / SportsEngine. All Rights Reserved.